Lamarr Kimble is back from foot surgery, 15-20 pounds lighter and ready to bounce back. 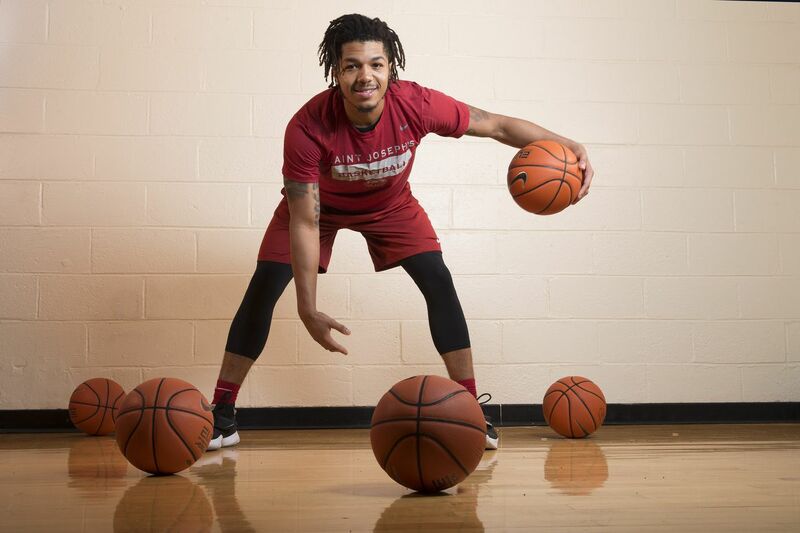 Saint Joseph's guard Lamarr "Fresh" Kimble isn't going to miss the companion he had for most of the 2017-18 basketball season. The protective walking boot the redshirt junior wore on his left foot while it healed from surgery is gone, discarded with the hope that it will never be needed or seen again. Still, the boot accounts for only a small percentage of the weight that Kimble has lost since he began rehabilitation to return from surgery to repair the fifth metatarsal after reinjuring his foot in the 2017-18 season opener. Kimble has reshaped his body, turning baby fat into lean muscle and dropping 15 to 20 pounds. A lighter body will reduce force impact on his foot. "With the boot gone, I was able to take this whole summer to work out, work on my body," said Kimble, who first injured his foot in February 2017. "I'm feeling really good right now. "I was around 195-200 pounds. Now, I'm about 180. I really took the time to change my diet and start eating better foods. "You never know if something is going to happen and you'll get hurt, but what I want to do is to be able to control all of the things that I can control. I'm lighter on my feet – way lighter on everything." St. Joe's coach Phil Martelli is hoping Kimble, who starred at Neumann-Goretti, brings back in full measure the tough attitude he gained by working his way up in the Philadelphia basketball scene. Last year during an up-and-down season that featured 10 losses by fewer than five points, Martelli often talked about his team's lack of an "alpha dog" personality. He said he had a group of nice, fine young men, which was a good thing but didn't necessarily help stop a losing streak. Kimble is also a fine young man, but he has a competitive streak that will hold himself and his teammates responsible to clean things up when they aren't going well. "Last year was hard for me emotionally," said Kimble, who averaged 15.5 points and had 107 assists in 24 games as a sophomore. "I wanted to be out on the court with my guys. "There were times when things weren't going right for them, and I felt I could've done some things that would've helped make us better. "Being from Philadelphia and learning to play on the streets, you come with that attitude. You've got to prove yourself every day. The next day is not promised, so every time you get on the court, you have to give 100 percent. I think we kind of lost sight of that a little bit." Lamarr Kimble flapping his arms with the St. Joe’s Hawk ahead of his team’s game against Villanova last December. Kimble missed nearly all of last season with the injury to his foot. Kimble said the thing about the Hawks is that chemistry allows anyone to offer constructive criticism that will make the team better. "We all treat each other as brothers," he said. "It's easy to take corrective criticism from your brother. Anyone can tell anyone else on the team that I feel you can tighten up on this or tighten up on that. You have to be open enough to take that so we can all do the things that the team needs." A year ago at this time, Kimble was looking forward to making a return, which ended up lasting just one game. Still, he enters the season without apprehension. "I know that everything isn't going to be sweet all the time," Kimble said. "I'm going to have some games that I'm not going to like. I'll just have to go one day at a time and keep trying to better myself. I'm just happy to be back."